The halves of two bodies, one belonging to a female Swedish politician, are discovered in the middle of the Øresund Bridge, which connects Copenhagen in Denmark with Malmö in Sweden. The body, cut in half at the waist, has been placed precisely on the border between the countries, thus falling under the jurisdiction of both the Danish and Swedish police agencies. After further examination, it turns out that the body is that of two separate corpses, with one half belonging to a Danish prostitute. Saga Norén, from the Swedish side, and Martin Rohde, from the Danish, lead the investigation to catch the murderer. The investigation quickly escalates as a journalist, Daniel Ferbé, whose car was used in the crime, begins receiving phone calls. The caller, who becomes known as the "Truth Terrorist", claims to be committing his crimes in order to draw attention to various social problems. 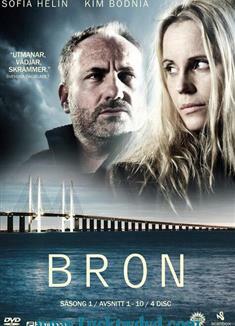 A social worker, Stefan Lindberg, whose sister becomes a victim of the Truth Terrorist, becomes an early suspect. However, events soon lead the Danish and Swedish teams to conclude that the killer has connections to the police. They discover that the crimes have been planned over a period of several years. The trail eventually leads them to Jens, a Danish policeman and former close friend of Martin's, who was thought to have committed suicide after an accident on the bridge caused the deaths of his wife and son.